In need of something fancy! This gorgeous salad will definitely wow your next round of dinner guests. 1. Place veggies, mango and cilantro in a large bowl and toss to combine. 2. In a small bowl whisk together dressing ingredients and set aside. 3. In another small bowl combine ground almonds and salt and pepper. 4. Combine egg and milk. 5. One by one douse each shrimp in the egg and milk mixture then roll them in the almond mixture and set aside on a plate. 7. Drop shrimp into the oil and fry, turning once, until golden brown. 8. Remove from oil and leave to drain on paper towels. 9. Pour dressing over salad and toss to coat. 10. Divide salad amongst four plates and top with peanuts. 11. 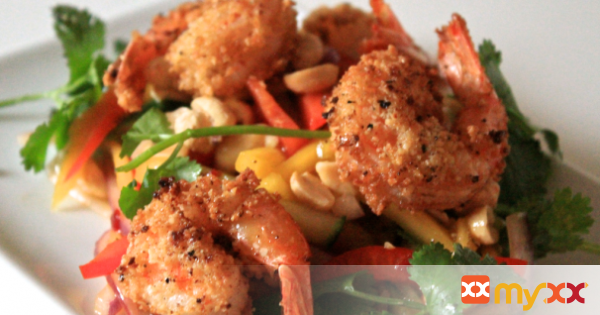 Arrange four shrimp on top of each salad and serve immediately.